I was born in SRF in 1951 and and have good memories of the town growing up as a young boy. Went back in 2009 to reminisce. For me i had gone back in time. So sad to hear the mill never reopened, the old movie theatre gone, and other buildings too. It had that “Mayberry” feeling. Hope I can make it back someday. I attended high school in Mexico City . My father worked for Sonoco Paper Products ( headquarters in Hartsville , SC ). In 1956 – 57 he left Mexico to go to Smooth Rock Falls to dismantle a paper machine in there and ship it to Mexico City , off load it , reassemble it and put it in to operation . He did all that successfully . One story he told was that he asked around the plant in SRF who could help him with crane / forklift A young teenager was recommended with the caution that he was a bit wild . That was who he hired . For years I have wanted to visit SRF to see where he went and get a better sense of what he did and the enormity of it all . I would love to know if anyone of the readers here might be aware of anyone who might have remembered my Dad ? His name was Al Boyers . Tall , striking blue eyes , very engaging , with great sense of humor . If so … let me hear from you . I hope to make a trip up to your town . Thank you . First of all: hello to my cousin Karen Werzun. I was born in Smooth Rock in 1950. The family moved to St Catharines in 1963. My mother is Irene Werzun and she was born there in 1925. Some of you may also remember my dad Ferris Johnson and my brothers ED,Bob and Greg. It was a fun place to live. I remember a lot of the names in this message board. Hi everyone! Wonderful to read all your stuff. I remember some of you, like Susan and Dennis as former students. We will never forget SRF. It was a wondeful place, as some of you said, a place where you were raised by the community. I’m a little bit retired now. Still live on a farm, enjoying our 5 kids and 6 grandkids. I remember serving on town council with Alex Roberts, Stan Lebedick, Harry Stolte, Tommy Moore, Louis Kadikoff, Rene Loubert. And, of course, I remember Gary Logan, as well as Lorne Neve! It’s good to see names honored there, like Basil Merchant and Liz McCafferty. Last time I was there Marcel Levis showed us around. Some of you remember my wife, Lynne Robertson, yes? Anyone want to contact me…it’s eelspear@aol.com. I love this site! Thanks to Dennis Oleskevich for finding it; as usual, he always finds the right kind of sites he knows we will enjoy. I was born and raised in SRF. 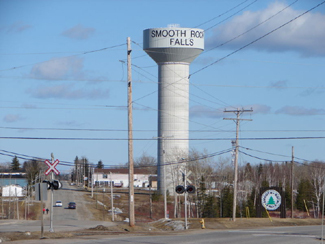 My dad Victor Dufour worked for the town of Smooth Rock Falls for 40 yrs. Dufring those awesome years, he plowed all the driveways in town, him and Werzum, and before this it was Mr. Filion. We really miss the old town. We had a very rich childhood there, not with money but filled with incredible people that new all our family. Teachers that thaught our parents, then us and then our very own kids..went you went in the store, bank, movie, arena..everybody knew who you where, every body started a conversation with you. All knew your dad, your brothers, your siblings..it is just amazing when you are well known. It makes you feel special. This is how we grew up. Life was not all easy, we certainly had our share of bad luck like everbody else but We will always cherish the fond memories of being raised up north in SRF, ON..gabynorton i.d on Facebook see y’a there! I was at the smooth rock falls reunion in Ottawa on the weekend, I was disappointed that there were few people there that still live in Smooth Rock, I did however meet Paul Gallant and eugene cote, both were very friendly and receptive, eugene sure looks good for his age, I was with mike my husband, his mother georgette, his brother gary, Garys wife Nora, Noras sister lynda, her partner Andre boutet aka colonel sanders & kenny rogers, my cousin diane couture and my friend claire desjardins I sure wish that we could have had a wine and cheese party or something other than a dance with a noisy band as it was hard to reminisce with all of the noise, guess we are getting old, mike says no we are not getting old we are old! If it was not for the arsenault and the therrien family, there would not have been very many people there. Chris: I remember your family. I worked with your dad during the time he was in SRF. Victor & Audrey, 3 children (I don’t remember the children’s names.) Please e-mail me sheila-jacques@hotmail.com with news of your parents. I grew up in SRF from 1975 to 1980. My Dad was OPP, and we lived in the white home by the river. I have fond memories of SRF. I lived in the pool in the summer, and tobogganed all winter long. I loved to cross country ski for electives in school. I understand that there are some old classmates still there, and would love to hear from them. I visited SRF about 5 yrs ago, when I went to my Grammas funeral in Cochrane, and the home I grew up in was for sale. I hope a family bought it. I also noticed there was a playground at the bottom of the old tobogganing hill. A question for Kelly who moved to SRF in ’06 from Oshawa.We are seriously considering moving to SRF this winter or coming spring.How hard is it to get a family doctor? I spent the first 20 years of my life in SRF, and I must say, me and all of my peers turned out pretty damb good. I have the best parents anyone could ask for, but any kid that grew up in SRF was raised more or less by an entire community, thats something only a town like SRF can offer. Don’t get me wrong you could get into trouble if you looked for it, but you were always safe. I wish I could stay 16 years old in Smooth Rock Falls for ever, mom and dad may dissagree. Thanks for all the memories, and the new ones too come. P.S. lets not talk about SRF like it’s dying, it’s still breathing and will keep going for years too come!! What a touching piece. I’m from Kapuskasing. You’ve spelt “damn” wrong. My grand parents lived there for years they where James and Mary Bruce, They lived in the lil blue house on 4th. I spent many summers up there with them and my uncle gordon. I have often wondered what the house and town look like anymore sad to hear about all the closeing business there. Can anyone tell me if Jack Moore or his dad Brain are doing my email is doolittle_lonnie@yahoo.com if anyone would like to let meknow any info thank you for the great memories SRF!!! As a child,I would spend summers in SRF at my grandfathers farm/cabin that used to belong the the Johnston family. It was located at the first consession/dirt road off Hwy#11,just West of the bridge. My grandfather was Robert (Bob) McKenzie and at the time of his death our family had decided to sell the farm. Hopefully I will buy back the property and retire there when the time is right. Its too bad that google maps does not offer a clear view of the farms property which is situated along the Mattagami river. Smooth Rock Falls is an awesome place to visit and live, I really miss farm and the friends our family had there. This summer, I may be making my way back there for the first time in 27 years. WOW !!! …any site to hear about SRF happenings past/present is cool !! Keith – I remember your family well and with great fondness. Our parents were good friends and I have memories of Pam taking me to swimming lessons. It’s great to read all these posts – Smooth Rock Falls was a great place to grow up (still is) and you can see how attached people remain. The mill closure was terrible but Northeners are a resilient people. I was the secretary at the SRF OPP – started in 1972. As you well know your dad, Lorne, was the detachment commander there from 1964-1973, so he was my boss for a little over a year. I remember your mom, Helen, as well as you and your siblings: George, Pamela and John. I doubt if I would recognize any of you now. Best wishes to you and your family. 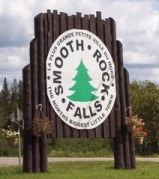 (Check out Fans of Smooth Rock Falls via Facebook). Smooth Rock Falls was home for me from 63 to 73 as my father was posted there with the OPP. Sean I believe your dad was Chief for part of that period as well. Fishing in Richmond Creek, being able leave doors unlocked and not worrying about anything is what I remember of my days there. Oh and running the logs on the river was always a blast. My husband and I just bought our retirement home on Sand Lake. It is great reading all the comments about Smooth Rock Falla. We have eaten at Smoothies a couple of times and found it a very friendly place. We are so looking forward to our new home. I knew your father Jim Bruce and his wife Mary. It is so sad that they died only a few months apart from each other (Mary on November 24, 2001 and Bruce on June 27, 2002). Their little house is still there although I donít know if it is currently occupied or not. I pass it every day, havenít taken any real notice of it. Brian Moore is still in SRF. - If you want to see stuff on SRF check out our townís website. See my information above, dated 20-02-10. Thanks for your nice comments about our little town. Although I never was aresident of SRF, my father and step mother were. My late wife and I visited that wonderful, wonderful little town in 1987 and then in 1999. I wonder if anyone can tell me what happened to my dad’s house in 4th street? Jim and Mary Bruce. It is sad to hear that the mill is now gone. Because I am so far away, I am not able to offer any help what-so-ever. Mary, my step-mom worked at the hospital. I remember with fond memories Brian Moore and his family. Anyone know of their wherabouts? Please tell me more about SRF. Of it’s memories I often dream about. I dream of being there once again. Maybe one day I will bring my new wife to show her what beautiful people are really like. In SRF. - For historical information on Town of SRF contact sheila-jacques@hotmail.com (in subject line enter ìHistory of Smooth Rock Fallsî so msg will not be treated as spam). Sheila Priebe-Jacques, 705-338-2939, President SRF Historical Society – Curator of SRF Museum (Heritage Centre), located in former Trinity United Church, 45 Third Ave.
- Check out http://www.townofsmoothrockfalls.ca. Click ìHistoryî tab. Interesting Facts (my tidbits), at top of this page ìHistory-Familyî, etc., will give you an outline of my research. There are also old photos of SRF on this site (not mine). Enjoy! For Sean Logan. Hello Sean – we lived right next door to you and I used to babysit you. I think there were three of you at the time and I remember when your family moved away. SRF holds fond memories for me. Growing up there was so much fun. The arena and community complex was the center of activity for us. We used to have teen dances monthly there. Is this facility still standing? I believe the Bednarz (spelling??) ran it at the time. So said about the mill. Abitibi provided a good living for us all. For a time most of the homes were owned by Abitibi and our families rented them. This is so amazing that I have found this forum to speak to people from Smooth Rock Falls !! My mother grew up in SRF. Her name was Myrtle Doonan, daughter of Mildred and Morley Doonan and had a sister Dora. My grandfather Morley Doonan worked at the Abitibi Pulp and Paper Mill in SRF. I was born in Toronto and shortly after birth, moved into the Doonan home and lived with my grandparents in SRF for six years. I have lots of old pictures of the mill and the town. I very much remember The Inn. We has a very good friend Shorty Graham who lived in The Inn. I also remember the Oleskovich family. My parents were married at a church in SRF. I heard hat it has been closed for many years. The Doonans lived just down the street fron this church. My grandfather Morley Doonan also played violin in a band in Smooth Rock Falls, maybe the same band !! I still have his violin. I am planning a trip to Smooth Rock Falls this summer and can’t wait to go back. If you or anyone you know knew my family please let me know. My home phone is 905-722-8102. I also come from SRF. Born 1935. 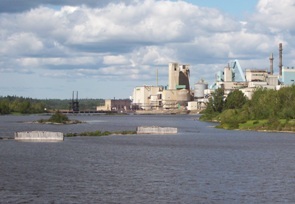 Work as assistant employment supervisor when the mill was owned by Abitibi. I have been in Ottawa for the past 40 years and I visit SRF at least once a year. I recognize some of the people who have posted comments, Logan, I knew the father (OPP), Gallant, I know him as well as his parents. From 1955 to 1962, I had a band in SRF called, the rythm kings. Some of the players came from Kapuskasing and Cochrane. There is a lot of good things that could be said about SRF but there is not enough space to recount every interesting thing. Cheers to all of those who come from SRF as well as those who wished they came from there. We moved to S.R.F. in 06 from Oshawa. It is a wonderful place to raise my son and the people are very warm to us. It is such a shame that Timbec has taken the only means away from people to support their selves. SHAME! SHAME!!! This is my home now and I am happy to be here. I used to live in Smooth Rock, I was born and raised there but unfortunitaly had to move when I was 16 because of the mill. Now, almost 4 years later, after fighting with tons of people, I get to move back to my wonderfull and amazing home town, but it is sad that such a great town is starting to go to a waste because no one cares enough to build new attractions and jobs so more people will come. I have read all the messages, and I am still amazed at what Smooth Rock had to offer before I was born, and I am sad to know, no one ever tried to rebuild what was lost in thos unfortunit incidents. If any one is willing to help the town grow bigger, I am more then willing to help. This is a very cool site! I’m dealing with what to do with 3 acres of incredibly beautiful land on Departure Lake. My father purchased the land back in the late 40′s and ran the Departure Lake Inn there until lightening burned the joint down in the mid 50′s! I visited your area back in the mid 80s with my dad. It was/is beautiful. A rushing stream runs through the land on the way to Departure Lake. Anyone out there familiar with the area? I’ve been fighting with either selling the land OR bringing my family up to see it AND possibly building a cabin there. My family and I have been in serious discussions of coming home to Canada especially after the last decade! I’m looking to find any members of a family named Labansky. Please contact me I’m trying to find some information about my family which you might have. Sean, if you are still checking this site..in answer to your question, the Inn is no longer standing…it got too old. As for your father, he knew my dad quite well. They were friends and had lots of coffees together. My wife & I spent part of our honeymoon in SRF in 1988. Her grandfather had lived there. He settled there in the early 1930s, working in the mill. He had come from Poland by ship. After he saved his wages and got his house, he sent for his wife and 3 children. Together they raised 2 sons and a daughter (my mother-in-law). She came to Toronto pre-War and married a guy from Driftwood. In Toronto they raised 3 daughters & a son. We have made several trips back to SRF over the past 20 years including one where we took my mother-in-law and her sister-in-law (also from SRF). Its a beautiful, peaceful place, with all the important things. I’d like to live there, but my career is in Toronto (and so is my wife’s), plus all of her family is down here, none left in SRF. Sean, do you mean the Elite ? The Elite Hotel ? Don’t know what you mean by “The Inn”. I just purchased a house and moved here on Halloween 08. This is a great town, with lots to offer. Housing is inexpensive and the people are friendly. I hope to be here for a long time. As for the inn I don’t know what that is. For starters I was raised in Smooth Rock and have not been back in over 35 years. It is noce to se the small town feeling is still there, yet with some new additions. It’s sad to hear of the closing of the mill. My father was the Chief of Police prior to the O.P.P. taking over, which took our family to southern Ontario at the time. If anyone does read these comments please let me know if The Inn is still standing.